Feb 26 Update: New Marriott Rewards points expiration policy, KLM extends Business Class sale, 15 bonuses left in our exclusive promo on FFB! Here is our final update of the week and for February! More bad news from Marriott Rewards. They have now announced that they will enforce their point expiry policy. All points will now be forfitted if you don't have at least qualifying activity action within a 24 month period. What qualifies? Paid stays, Award stays, Marriott Credit Card purchases, earning with program parnters, purchasing points or holding a meeting or event that qualifies. What doesn't qualify are gifting or transferring points, receiving points as a gift or transfer, earning points through social media actions. This change kicks in on February 1st, 2016 so you have nearly a year to save your points if you haven't had a qualifying action since January 31, 2014. Is this huge? Not really, most hotel programs do have some sort of account inactivity period as do most airlines but still for those of you who don't use Marriott Rewards very often your points may disappear if you don't do anything about it. You can find all the details here. Don't forget about our Exclusive Offer with Kaligo offer: 2,000 Bonus AAdvantage/MileagePlus Miles or 3,000 Bonus Avios! Only 15 bonuses were left as of last evening! Here are our blog posts since the last update just in case you missed them. Of course the 50% off biz class between Edmonton and Europe is amazing! KLM has extended their great World Businesss Class sale to March 2nd! You can fly to Europe and beyond from only $2899 all in from the East or $3299 from the West! Find all the details here. Another good month awaits us in March with Air France KLM's Promo Awards! 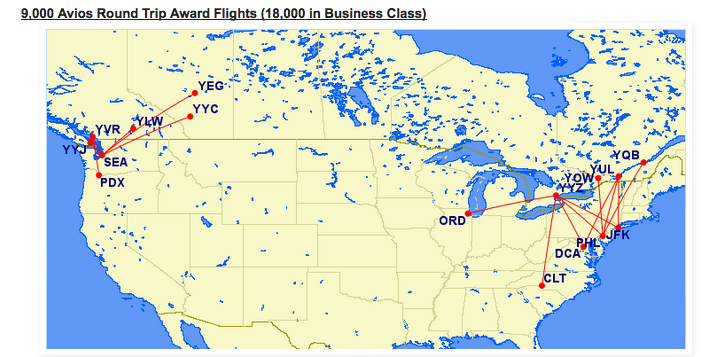 These award ticket deals are bookable as of Sunday and are good for award travel for May and June of 2015 (Edmonton flight doesn't start until May 8th). 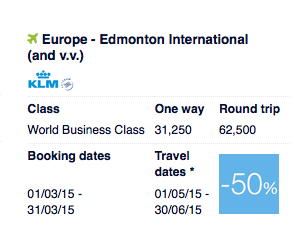 The offer once again has 50% off Business Class on KLM's new route out of Edmonton to anywhere in Europe! This is a great deal for those in Alberta and you can't complain by flying to Europe in style for only 62,500 miles round trip! 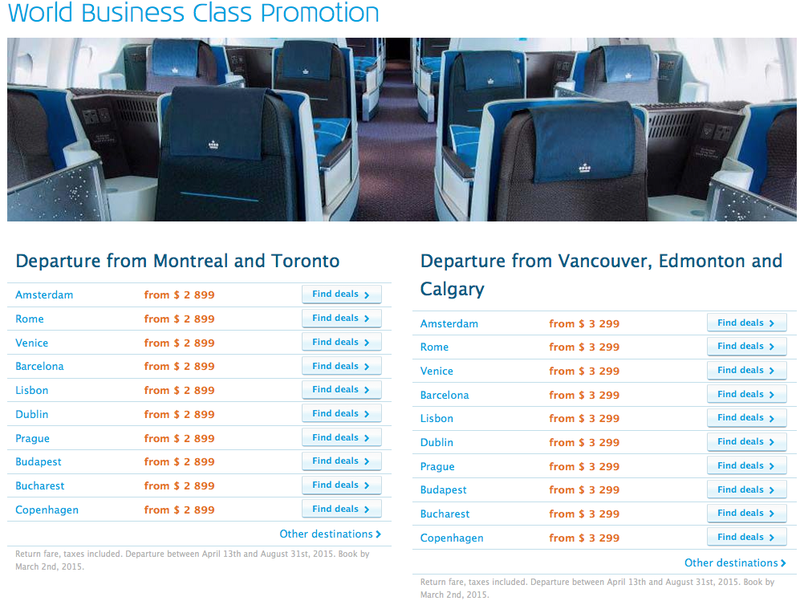 The other offer is 25% off World Business Class for KLM between Toronto or Vancouver and Europe. While not great, taking 25% off if you are a Flying Blue member it is a good deal if you were planning on redeeming at full price! Don't have the miles? We have two options for you to get more miles. You could always consider transferring Starpoints earned via the Starwood Preferred Guest Credit Card from American Express to Flying Blue. The card has a 20,000 Starpoint bonus right now which translates to 25,000 Flying Blue miles, which gets you close to at least one way in biz class between Edmonton and Europe! Ivory members can buy up to 75,000 Award Miles each year. Elite members can buy unlimited Award Miles. Award Miles are sold in units of 2,000 Miles. Promotion valid until 15 March 2015. * For the promotional period, Elite members can receive a maximum bonus of 50,000 Award Miles on purchases of up to 100,000 Award Miles. What are the promo awards? The promo awards are a discount of 25-50% off the regular Flying Blue mileage requirement for select Air France, KLM, Air Europa and Kenya Airways award tickets in select cabins. To take advantage of this deal you must book your promo award ticket between Mar 1 and 31 for travel between May 1st and June 30 2015. More details can be found here. Care to comment? Do you agree or disagree with us? 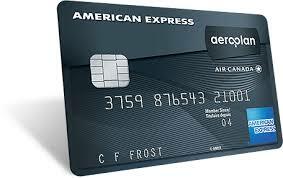 Tell us what think about the American Express AeroplanPlus Reserve Card by commenting below! Feb 26 Update: TD Aeroplan $100 credit back to being targeted, Marriott Rewards Hotel Category Changes, Answers to reader questions! Lots of items to pass along to you today! 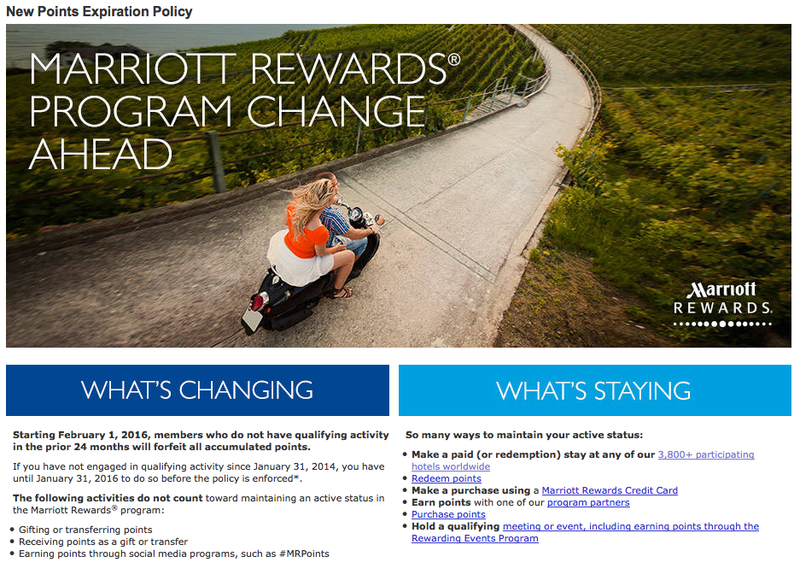 Marriott Rewards has announced their hotel category changes for 2015. The list of changes is huge, apparently over 25% of their hotels are moving up a category, that's a huge change. The PDF list of hotel changes is painful to read but from first glance it appears that 9 hotels in Canada are moving down a category while 10 are moving up. You can read the PDF list of changes here. Reader question on a topic we have covered many times before! What my wife and I are looking for is avoiding the 2.5% surcharge made on top of the exchange rate for transactions made in a foreign currency. Do you know of a card that will waive this fee? "There are only a few cards that don't have the 2.5% fee charged and all are from Chase. Our favourite is the Chase Marriott Rewards Premier Visa (https://www.marriottpremier.ca/?JOBNUM=VMR1207095) as it has very strong rewards and the lack of the foreign transaction fee! The other Chase options that don't have the fee are the Sears Voyage MasterCard (https://www.chase.com/online/canada/voyage-en.htm) or the Amazon.ca Rewards Visa (https://www.chase.com/online/canada/amazon-ca-home.htm)"
Do you have a comparable subscription newsletter for the USA? "We sure do, our global website FrequentFlyerBonuses.com has a weekly newsletter which you can subscribe to at http://frequentflyerbonuses.com/mailinglist/?p=subscribe"
If you haven't joined Etihad Guest yet you can get 1,000 miles for doing so when you complete a mileage earning action before March 31st. One of those actions could simply be transferring American Express Membership Rewards Points to Etihad Guest (and they have 25% bonus on those transfers!) See details on the transfer bonus here and for the joining bonus see the link below in the bonus offers section. Question: I found this promotion on a search but it is unclear whether it is available to all TD Aeroplan Visa infinite Card holders or alternately that it is a targeted promotion to some cardholders only. Can you let me know whether all card holders are eligible for this benefit? Receive a $100 statement credit: From January 8, 2015, to April 30, 2015 Receive a $100 credit on your credit card statement when you use your TD Aeroplan Visa Infinite Card to make a minimum $100 Air Canada purchase. SabrinaTD Moderator: Great question, paulme. It might seem too good to be true, but it's true! When you make an Air Canada purchase of at least $100 on a single transaction with your TD Aeroplan Credit Card between January 8 and April 30, 2015, you'll be eligible to receive a $100 statement credit. You must be the primary cardholder on the account to be eligible for this offer. The credit will appear on your account statement within ten weeks after your purchase. IHG PointBreaks are now live! There are only 2 hotels in Canada participating this time but there are about 150 other hotels Worldwide also included in this still amazing and best hotel award night redemption option. Read our post from yesterday for details. 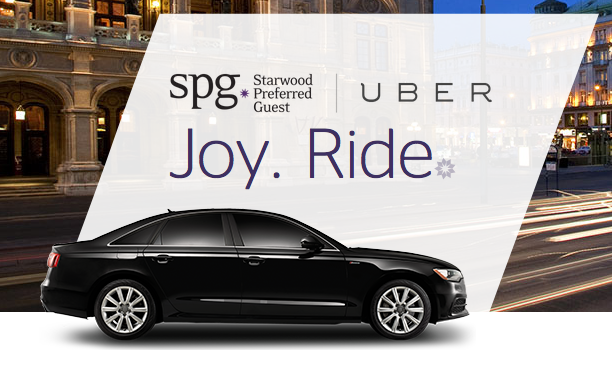 Starwood Preferred Guest and Uber have teamed up. Simply link your accounts at spg.com/uber and when you complete at least one SPG qualifying Starwood stay you'll earn Starpoints for using Uber. - Triple Miles&Smiles Miles for stays at the Rixos Krasnaya Polyana Sochi. More... Until ? We mentioned not too long ago that Hilton was changing their promotion strategy this year from 4 global systemwide bonuses to only 2 and then targeted offers for members. We are happy to announce that the first of those 2 global systemwide bonuses is now open for registration for stays starting on March 1st. The offer is simple, Double Points or Double Miles, your choice but once you make that choice during registration you can't switch during the promotional period. The list of hotels that have chosen not to participating is once again very U.S. heavy while outside of the U.S. there are only a few hotels that are not. Today we welcome Rewards Canada's newest contributor, Bill W! Bill is a true road warrior, his work has him driving and flying across Western and Central Canada every week while staying in a variety hotels from a variety of chains. Bill has been reading, following and even giving Rewards Canada tips and updates for a very long time so it is only natural to have him come on board and have him share his insights into the world of Travel Rewards! Today Bill shares with us the details of the recent change in Air Miles Reward Miles accumulation at Shell stations in Canada and tips on how to combat this change to earn more miles on your gas purchases. Shell recently and quietly changed the Air Miles collection guidelines when filling up with gas. The old earn rate was 1 Air Miles Reward Mile for the first $20.00, then 1 mile for each $30.00 thereafter in the same transaction. As a result, a fill-up of $80.00 would result in an award of 3 Air Miles. That has now changed. The new parameters are with a minimum 15 litre fill, you will receive 1 Air Mile. That's it. 1 Air Mile. It does not matter how much more you spend or how many liters of gas you purchase in the same transaction, you will only get 1 Air Mile. The only way to get more Air Miles is to do multiple transactions (put in 15 litres, stop, complete the transaction, and then put in another 15 litres, stop and complete the transaction. Continue to so this until your tank is full. I drive a vehicle with a 118 litre tank, so this would mean approximately 7 transactions for 7 Air Miles. However, Shell is currently running a promotion (Offer valid from January 5 - March 1, 2015) where you can obtain 4X your base Air Miles if you purchase Bronze, Silver or Diesel grade fuel and 20X if you purchase Shell V-Power Premium fuel. This promotion, however, requires you to purchase a minimum of 25 litres of gas. This is where the multiple transactions would be beneficial. Using my vehicle with a 118 litre tank as an example, I would be able to complete 4 transactions of 25 liters. At 4X the base, I would get 20 points. If I were to purchase Premium grade gasoline, at 20X I would get 80 Air Miles. You will have to decide if it is worth it for you to do this to maximize your miles accumulation. The choice is yours, but I would take advantage of this offer while it lasts. Screenshot of Bill's accumulation at Shell utilizing his multiple transaction tip! This reminds us of the first Air Canada / Aeroplan Star Challenge where tons of people would fill up at Esso with multiple $3 transactions to reach the various bonus tiers! We just learned that a card featured in our top 5 sign up bonuses for February will be ending in four days! The Scotiabank Gold American Express Card will be reverting back to its standard 15,000 Point bonus with an annual feee as of March 1st. If you have not jumped on this card yet now is the time to do so as you'll get 20,000 points when you reach $1,000 in spending in the first three months. That 20,000 points is equal to a $200 travel credit and since this card is a book anywhere card you can book the travel how you want when you want and when the charge shows up on your account you can redeem the points against the charge. The card normally has a $99 annual fee but of course that is waived in the first year as long as you apply by February 28th. You can apply for the card here or read our review of the card first to see if it is right for you! SPG's 2015 annual hotel category changes is the big news today! "Just over 22% of hotels are changing category; of these, 10.49% are moving up and 11.78% are moving down including some favorites such as The St. Regis Rome, The Westin Kaanapali Ocean Resort Villas, Maui, W Paris – Opera, and others." These changes take effect on March 10th so we reiterate the old addage that you should try to book award nights (if you have planned any) for hotels going up before the 10th while those that are going down you should wait if possible to book after that date. I am very happy to see one of my favourites, the Westin Ka'anapali Ocean Resort Villas go down! Closer to home, 2 Canadian properties are moving up Four Points by Sheraton Prince George (Cat 3 to 4) and the Four Points by Sheraton Waterloo - Kitchener Hotel & Suites (Cat 2 to 3) while 15 (that's right 15!!!) hotels in our beautiful country move down a category. Some highlights of those 15 are The Westin Ottawa, Le Meridien Versailles, and the Le Westin Resort & Spa, Tremblant. You can view the entire list of hotel changes here. 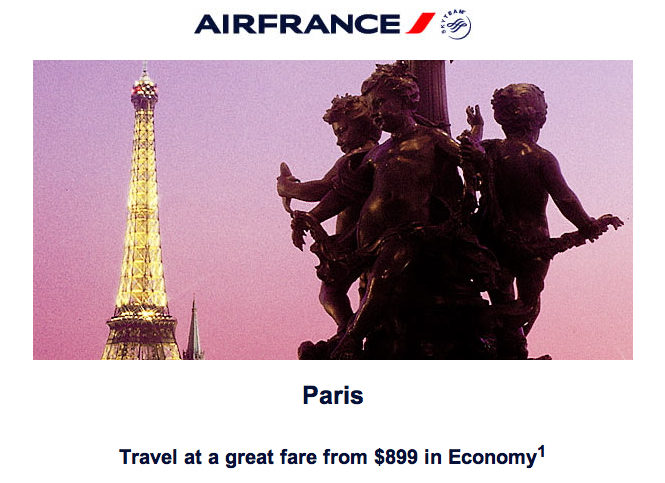 Last week we brought you the details of the double Flying Blue miles offer for flying on Air France's new Vancouver to Paris and now AF themselves are promoting it heavily along with a great economy class sale on the route starting at $899 all in! Simply book online at www.airfrance.ca and be sure to include your Flying Blue number on the reservation to earn the Double Miles (Mar 29 - Jun 18). While your in Paris why not stay in a Hilton to take advantage of the bonus listed below! As we mentioned on Twitter a few days ago the new IHG Rewards Club PointBreaks list would be available today and here it is thanks to the info posted on the IHG blog! The 150 hotels participating in this set of offers will be bookable as of tomorrow Feb 25 for stays Feb 25 - May 31, 15 (subject to availability). For those of you stuck traveling within the confines of our beautiful country you'll only find two Canadian locations participating. The Staybridge Suites West Edmonton and the Holiday Inn Express Milton. We were lucky enough to be able to interview Sean Shannon, the Managing Director of Expedia.ca about the new program with more loyalty based questions. To start, Sean explained that the program is already quite big and did not grow from a 0 person status. Instead it grew from the Expedia Elite program that did not offer points but recognized frequent bookers with exclusive benefits at select hotels. 1. Although the program formally launched on the 21st, it was soft launched in November 2014. What has the traction and been like for people joining the program prior to the official launch and TV marketing campaign? How have the initial reactions been? Uptake was quick because of a clear base of customers from Expedia Elite that were rolled over into different status levels in the new Expedia+. From non Elite members there is postive initial reaction with not much negative pushback. For most, if they are already doing business with Expedia it just better but there are also some people moving from other programs to Expedia. 2. 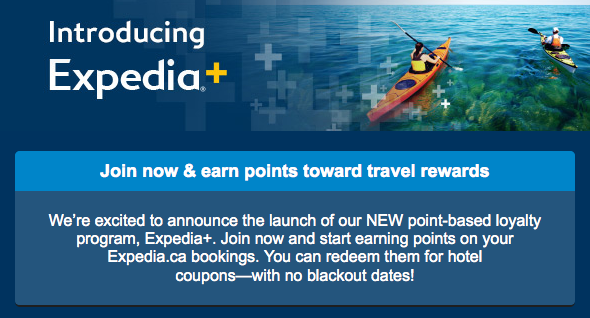 Expedia+ Rewards has existed in the U.S. for several years now and just recently went through a major devaluation (which seems to be par for the course for most programs these days). Could we expect something similar with the Canadian version or has the program been in development long enough that knowledge from the U.S. version and it's current reward structure (essentially the same for the .ca version) that it should stand true for a number of years to come? Everything should stay put, Canada did stay on the side lines until the U.S. went through the learning curves and found their sweet spot. By holding off and taking the knowledge of the U.S. program the Canadian program should stay how it is for quite sometime with its healthy balance. 3. Any plans for a co-brand credit card like the U.S.? Nothing immediately, they are watching the U.S. market and waiting to see what happens with the base of Canadian members. 4. One of our readers avoids booking Air Canada flights on Expedia.ca as the system logic behind the searches will only bring up Tango fares when booking 7 or more days out and not Flex Fares. He seems typical of many business and frequent flyers that like to book Flex Fare or higher on AC for upgrade purposes, 100% Altitude Qualifying miles etc.. Is Expedia working on a work around for this? It could be a major tipping point in getting the 'frequent traveller' on board with the Expedia+ Rewards program even though the marketing for the program seems to be targeting the infrequent traveller? FYI This reader does book AC fares on Expedia within 7 days of departure since Tango fares drop off and the lowest booking class becomes Flex. The system that Expedia runs doesn't support that at this time. It will only pull the lowest available fare class so Flex Fares outside of 7 days will only show up if Tango is no longer available. 5. Hotels are big business for Expedia however many Canadians are unaware that most major hotel chains do not award their own loyalty program points or elite stay credit for bookings made via Expedia and other OTAs (and only a handful extend Elite benefits on Expedia stays). Do you plan on letting travellers know that this is the case and that they shouldn't expect to double dip on hotel stays? I notice there isn't any mention of frequent guest programs in the marketing or press release but there are numerous references to frequent flyer and credit card programs. This could lead to some potential confusion and the odd guest who will be 'mad' that they didn't earn Starpoints, Gold Passport points etc. on their stay in addition to their Expedia+ points. Or is the 'frequent guest' such a small portion of Expedia's booking clientele that it isn't really on the radar? Our customers are less concerned with status benefits or earning points in hotel programs as they are more leisure based and price sensitive to where they stay so they are not loyal to one chain. It is mentioned in the T&Cs for frequent guests to make them aware of potentially earning or not earning points/benefits in their preferred hotel frequent guest program. Expedia doesn't want to hide it from people so that someone is not blindsided and would have made a different booking choice. The 3rd party booking rule put ibn place by most hotel programs are always subject to negotiation and those are things that may always come in the future. 6. You talk of the triple dip, Expedia+ Points, Frequent Flyer and Credit Card points being earned on one booking. Do you plan on exploiting the other potential boon for customers when redeeming credit card points? With cards like the American Express Gold Rewards Card, TD First Class Visa Infinite and about a dozen others allowing you to book travel via any provider then redeem the points against the charge on the statement it could prove beneficial for Expedia to promote the earning of Expedia+ Rewards, Frequent Flyer miles etc. on the booking all the while saving money by redeeming credit card points for the Expedia purchase. Definitely agree with the idea but it probably will not be marketed by Expedia. It is more so something that should be marketed by the credit card companies themselves as a way to triple dip and use their points. I want to thank Sean for taking the time out to answer our questions about the new Expedia+ program! In the mean time if you are or will join Expedia+ be sure to take advantage of their current bonuses like Double Points on Packages and Triple Points on bookings made via their app. British Airways Executive Club has launched their best buy Avios offer yet. Is it worth taking advantage of? It definitely can be especially if you buy Avios at the higher levels. This is because the price goes down with the more Avios you buy. At 3,000 Avios, you'll get a total of 4,500 with the bonus for US$108 or 2.4 cents per Avios. At 35,000 you'll receive 52,500 Avios for US$988 or about 1.88 cents per Avios. Canadians of course have to pay GST on top of this since Points.com who facilitates the purchases is Canadian. At the top end rate even with GST it could very well be worth buying for redeeming multiple times on BA's famous short haul redemptions of 4,500 Avios one way/9,000 round trip. A great example is Toronto to New York or Calgary to Seattle! See our post on How to get select Canada to U.S. award flights faster by utilizing British Airways' Executive Club for more details! If you purchase 2,000 Avios or more before midnight 25 February 2015, you will enjoy our best ever bonus of 50%. Don't forget you can now purchase up to 35,000 Avios each year too, so if your current Avios balance doesn't quite stretch to a reward flight or upgrade, purchasing Avios is a great way to boost your balance. To find out more or to go ahead and purchase Avios click here. Amex has let us know the current public offer for the Starwood Preferred Guest Credit Card of 20,000 Starpoints will be ending on March 31st after which it will revert to the standard 10,000 Starpoints. We just wanted to pass this along as when the offer came out it was unknown how long it would stick around. This gives you a little over a month to apply for the card and get this great bonus. Unlike some other cards the first year fee of $120 is NOT waived however the 20,000 Starpoints is worth a minimum of $400 but more like $460-$500 all depending on how you value Starpoints. This card has been ranked the #1 Hotel Credit Card in Canada for years on end here on Rewards Canada and that is with the 10,000 point bonus. So you can only figure that doubling that offer makes this card even better! Find out more or apply for the card here. Here is the start of the week news and bonuses for you! IHG Rewards Club's PR team let it's slate of website and bloggers on their mailing list know last night that the next set of IHG PointBreaks will be released on Tuesday Feb 24. From the preview list of 7 hotels, we know at least one Canadian property is participating, the Staybridge Suites West Edmonton, Alberta, Canada. Keep an eye out right here on Rewards Canada for the entire list of hotels on 24th! Choice Hotels has launched their latest systemwide promotion and it is the same one we see over and over again! The offer awards bonus points so that you reach the 8,000 Point level so that you can redeem at over 1,500 of their locations Worldwide, lots of which are here on our home turf. I know there are a lot of our readers who frequent Choice properties here in Canada so I thought it best to highlight it up here in the news and tips. Find out more here! I had the luxury of speaking with WestJet about the targeted offer that select WestJet Rewards Gold members have been receiving and wanted to clarify who got it and how they got it. Members were strictly targeted based on the Status Match promotion only. It was not based on having any flight history with WestJet. Members who earned status the hard way with WestJet weren't targeted. If you did do status match and didn't receive the offer there is a good chance you didn't opt in for communications from WestJet Rewards when you joined the program so you wouldn't have been on the list. There isn't anyway you can get the offer after the fact if you opt-in now. So if you didn't get this offer sent to you make sure opt-in for future opportunities and this applies for all reward programs not just WestJet. Don't forget about our Exclusive Offer with Kaligo offer 2,000 Bonus AAdvantage/MileagePlus Miles or 3,000 Bonus Avios! Almost half of the 50 bonuses are already taken! - Fast Track to Gold Status for Oldcastle employees when you complete six qualifying stays at Hilton Hotels Worldwide within 90-days of enrolling in this offer. More... Until ? - 3,000 Bonus Starpoints for stays at the Element Vancouver Metrotown More... Until ? - 800 Bonus Starpoints for stays on the Pick your Perk Package at the Westin Georgetown Washington D.C. Hotel. More... Until ? - 500 Bonus Starpoints for stays on the Starpoints Perks Package at the Westin Georgetown Washington D.C. Hotel. More... Until ? - 1,000 Bonus Starpoints for stays on the Grand Opening offer at the Sheraton McKinney Hotel. More... Until ? Flight bonuses from the Flying Blue program tend to be few and far between especially so on the Air France or KLM flights out of Canada. So when we came across this one we were super excited! 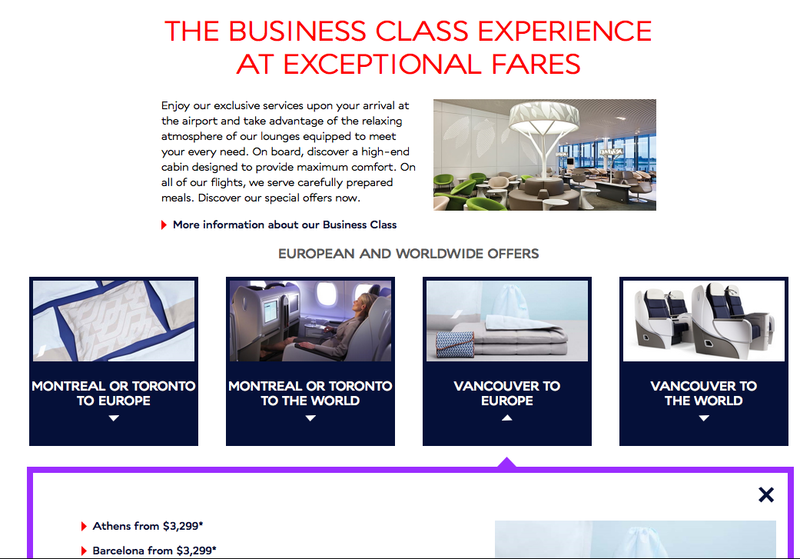 Not only is it double miles route launch bonus, Air France has a great business class sale going on right now for the route as long as you book by Feb 22! The fares are $3299 all in to European destinations and $3299 to $3775 to the Middle East, Africa and Asia! To get the bonus miles just make sure you include your Flying Blue number when you book your flights. Double Flying Blue Miles when you book an Air France flight from Vancouver to the destination of your choice at www.airfrance.ca and fly between 29 March and 18 June, 2015. Earlier today in our daily update we brought you a quick snippet on yesterday's opening of the newest Starwood Hotel in Canada, The Element Vancouver Metrotown. As part of the grand opening celebrations there is an promotion being offered of 3,000 Bonus Starpoints, Free Breakfast and a complimentary upgrade from a studio suite to a one-bedroom suite. We decided to see if this was a good deal or not and we feel it is! As you can see the 3,000 Bonus Starpoints offer is equal to the Fully Flexible rate but more than the AAA rate or Advance Purchase. It appears the free breakfast is a moot point per the rates all rooms include free breakfast. But is it worth it to pay the additional $27 over the AAA rate or $18 over the Advance purchase rate. Personally we always avoid Advance Purchase as we hate not having the option to cancel. But how about the $27 extra over AAA? Absolutely! We value Starpoints at a minimum of 2 cents each but more so around 2.3 cents each which means the 3,000 Starpoints is worth $60 to $66 in our books, which already beats out the $27 difference but then you also get the free upgrade to a Suite as long as one is available! By booking the 3,000 Starpoints rate you will come a minimum of $33 ahead and at least $77 ahead if you get the Suite as it prices out $44 more per night on the AA rate. Of course if you are not a CAA/AAA member then the 3,000 Points offer is a no brainer when compared the fully flexible rate. To find out more about this new hotel or to book the 3,000 Bonus Starpoints offer visit here. A great end to the week with the launch of an exclusive promotion from the FFB Group! Starwood Hotels opened their second Element Hotel in Canada yesterday! The Element Vancouver Metrotown features 169 rooms and is located on the northeast corner of Kingsway and Willingdon Avenue within Metropolis at Metrotown. And to celebrate the opening they are offering 3,000 Bonus Starpoints on all stays booked with promo code EYD3K (kind of odd as(that's typically the Earn Your Dreams code used for stays in Europe, the Middle East and Africa but whatever its a bonus!) 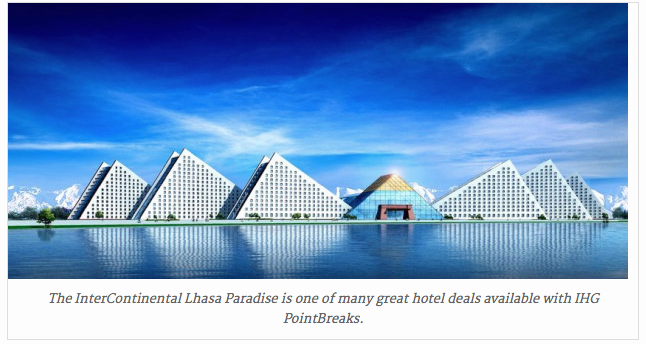 To find out more about this new hotel or to book the 3,000 Bonus Starpoints offer visit here. Yesterday we brought you the details of WestJet bonus offer on select routes in Western Canada that matches Air Canada's current promo. WestJet clarified that their offer is only for non-stop flights (no connections allowed) so if you are flying Regina-Edmonton-Grande Prairie you won't earn the bonus on the Edmonton-Grande Prairie portion. I reached out to Air Canada to see if this was the same case with them and it is not. If you fly a connecting route you will still earn the bonus on the portion of your itinerary that does offer a bonus. So with the example above you would earn only your base Aeroplan Miles between Regina and Edmonton but you'll earn base+bonus on the Edmonton-Grande Prairie portion. Looks like AC is the winner here. Air Canada is offering 15% off flights between Canada and Asia to celebrate Chinese New Year. Use promo code SHEEP15 when you book onlie. Book by February 24, 2015, at 11:59 pm from your city of departure in Canada, Valid on Tango and Premium Economy Lowest fares, Travel from March 1 to June 15, 2015. Find out more here. - 500 Bonus Starpoints for stays on the Unlocked Package at the Le Méridien New Orleans. More... Until ?